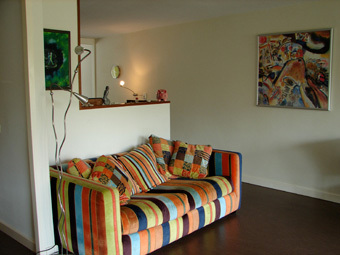 The apartment is situated right west of the center of Amsterdam, near the famous quarter: ’De Jordaan’ and next to the Westerpark. 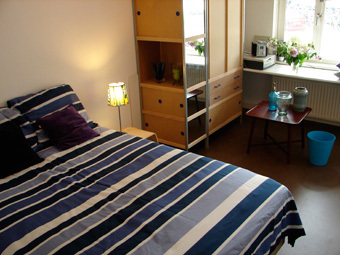 The quarter of the apartment is called: ‘De Staatsliedenbuurt’, as all streets are named after famous Dutch statesmen. The ’De Wittenkade’ (Quay white) is named after the two brothers de Wit. The estate has approximately 60 apartments. Your apartment is on the ground floor. The entire surface area is about 100m2. It includes two bedrooms, a living room, an open kitchen, a bathroom (with shower and bath) and a toilet. 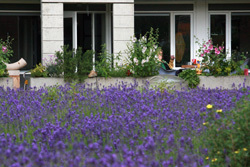 At the back is a terrace next to the communal garden. It is a very nice and quiet spot in Amsterdam. Bicycles and a parking space are available on request. The normal rate is € 40 per person per night, all included. You can ask after special and seasonal rates at the time you plan your visit. There are canals at the front and the back of the building. The one at the back is a busy thoroughfare for ships. Shops and supermarkets are just around the corner. Public transport, e.g. the tramcar, is just a minute’s walk away. It takes about ten minutes to walk to the famous Jordaan quarter and about twenty minutes to walk to Dam square, while passing the streets of the Jordaan with its small shops and many restaurants. It is possible to park your car in a locked parking place underneath the building. Bicycles are available, actually they are the nicest and fastest way to explore the city of Amsterdam. See what our guests wrote. Here is the calendar to see whether we have place for you.